Kevin Durant was absent from the Thunder lineup Monday with sprained toe. Russell Westbrook notched a triple-double Monday with 25 points, 11 rebounds and 14 assists. Thunder center Steven Adams tries to block a shot. Adams finished with 12 points, four rebounds and two assists. However, the Thunder doesn’t have any choice with the next two games against the New Orleans Pelicans, a team that has given Oklahoma City (24-24) problems all season. The Thunder plays at New Orleans (26-22) on Wednesday, and then returns home to host the Pelicans on Friday. The Pelicans posted a 115-100 win Monday over the red-hot Atlanta Hawks. Back-to-back wins against the Pelicans could bolster the Thunder’s season and possibly push the team closer to the eighth playoff spot in the Western Conference. Phoenix (28-22) currently holds that spot with a single game lead over New Orleans while Oklahoma City is three games back in the No. 10 spot. Memphis defeated Phoenix Monday, 102-101. Brooks is right. Every game is a big game for the Thunder, especially since losing two on the road to the hapless New York Knicks and the Memphis Grizzlies. Most notably is the absence of MVP Kevin Durant, who has missed two of the last three games with a sprained toe. Durant missed 17 games at the beginning of the season with a broken toe and then missed another six games with a sprained ankle. On Monday, however, it was teammate Russell Westbrook who stole the show with his 10th career triple-double with 25 points, 11 rebounds and 14 assists. The explosive point guard started the game in style, notching 12 points, three rebounds and five assists in the first quarter. At one point, Westbrook tallied six straight points and then added four consecutive free throws late in the quarter as Oklahoma City led, 29-22. By halftime, Westbrook had 16 points, 10 assists and four rebounds. Dion Waiters, Oklahoma City’s most recent acquisition, scored 24 points on nine of 15 shots while Anthony Morrow chipped in 15 while making all of his three-point attempts. 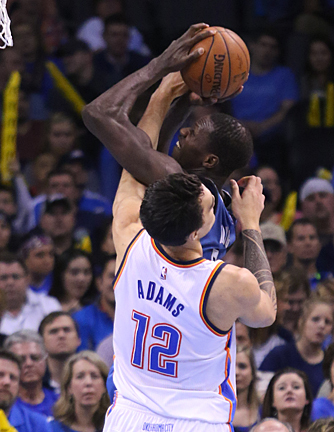 Serge Ibaka tallied 16 points and Steven Adams tallied 12 on five of seven shots. “For us to win my job is to be able to make sure everybody is getting the ball and make sure everybody is in the position to score and that was one of those nights,” Westbrook said. The fiery point guard received some high praise from Morrow. “He always plays with the same intensity and the same tenacity so he’s going to bring it every night. He does so much stuff on the court. I’m glad to have him as my point guard,” Morrow said. As a team, Oklahoma City shot 49.3 percent from the field, 40 percent from behind the arc and 84.6 percent from the charity stripe. Still, Brooks wasn’t totally sold on the defensive effort. Orlando tallied 52 points in the paint compared to 36 for the Thunder. “They did some things in the first half to get into the paint,” he said. Oklahoma City led 61-50 at halftime, expanding its lead to 22 points late in the third quarter on an Ibaka three-point shot. The Thunder led by double digits until late in the final quarter when Orlando nailed three treys to pull to within the final seven-point margin. Orlando (15-36) was led in scoring by Victor Oladipo with 22 points followed by Nikola Vucevic with 20. Three other Magic players scored 11 or more in the loss. GAME NOTES: Orlando outscored Oklahoma City 23-6 on second-chance points, but the Thunder tallied ore fast break points, 16-5…The Magic also grabbed more rebounds, 44-40…Oklahoma City had more blocked shots (5-1) and more steals (10-5)…The Thunder has a rare noon tipoff time Sunday when the Los Angeles Clippers visit Chesapeake Energy Arena.